Water provision is a rising cost industry in both urban and rural areas, with much of the water infrastructure in the U.S. at, or beyond, its useful life. Infrastructure replacement costs will significantly contribute to the unaffordability unless these costs are paid for in great part by external funds. In addition, some water systems, such as many in the Tulare Lake Basin, are facing challenges as legacy nitrate pollution or other contaminants like arsenic and DBCP continue to contaminate water supplies. In these areas, households must spend an even greater percent of their income purchasing replacement water, making affordability an even greater issue. As the persistent water quality problems in the Central Valley worsen, water treatment costs will increase, and systems may be forced to increase their water rates, leading to likely scenarios of increasing water bills in an area already plagued with high levels of unaffordability. Indeed, more and more water systems may find themselves in a difficult financial situation, torn between the need to upgrade or increase treatment to ensure safe drinking water while also keeping water bills low enough for customers to have access to affordable water. 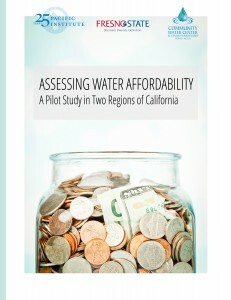 The study indicates that more specific discussion of developing affordability programs, whether within or across systems, will be critical for California, and more work is needed to address financing considerations for water systems, and their technical, managerial, and financial capacity. This white paper, Assessing Water Affordability: A Pilot Study in Two Regions of California, is the second in a series covering critical issues for water service providers as they deal with the “new normal,” including: water affordability, water financing mechanisms, and lessons from the energy sector. These additional white papers will be released over the coming month.